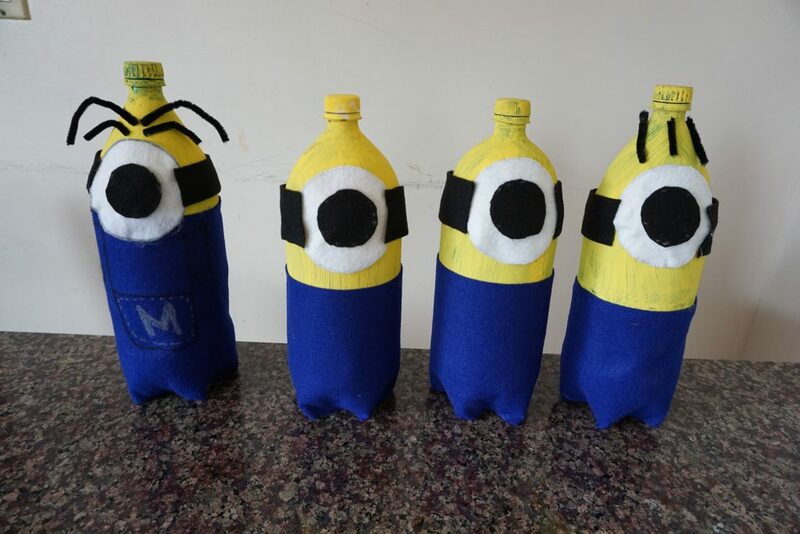 You are here: Home › Crafts & DIY › Minion Birthday Party Ideas! Annalee had her Minion 3rd Birthday Party, a couple of weeks ago. The turn out of her party was great she had a blast, the kids loved all the games and decorations on the dessert table! I first wanted to mention her beautiful outfit was send to her by my Mom in California, but I am sure you can find something similar to this on Etsy or Amazon. 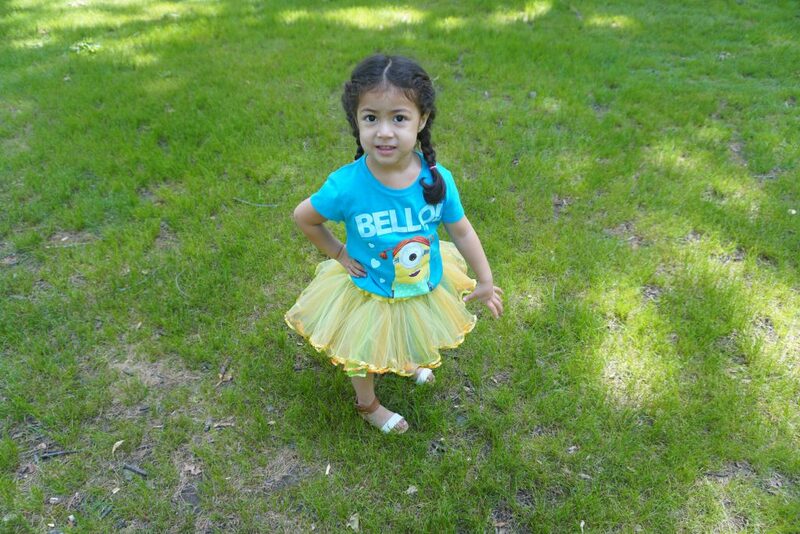 I was inspired by the Minions and created a couple Minion Birthday Party Ideas to make her party unique and super special. 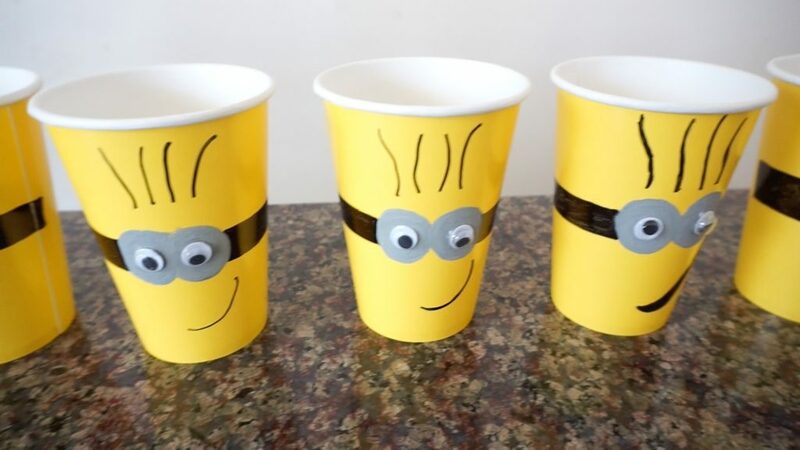 These Minion cups are so cute to drink from..
Start in the middle of your cup, draw two round circles with the silver sharpie and fill this in. Black sharpie create the black straps with a rectangular shape on both sides,also fill this in. Draw some crazy hair and different mouth for each. Hot Glue gun your Goggly eyes right in the middle of silver circle shape. 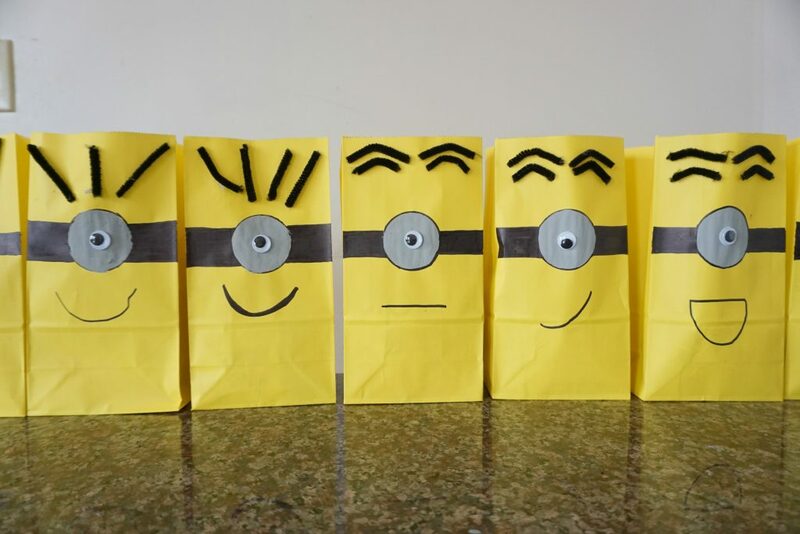 Fill in some Goodies in your personalized Minion Party Bag! Draw circle in the middle of your paper bag, you can use a small household object to get a perfect circle (I used a sauce container lid). Color in the middle circle with your silver Sharpie. Draw and fill in black side straps with Black Sharpie and draw a funny smile or frown. Cut your fuzzy sticks into small pieces and shape them for Minion hair. Well..this is a Minion Bowling Party Game. Bring a ball set them up and let the kids play bowling! Paint the first half of your bottle with the yellow paint. Let Dry. Cut out small black circle, and larger white circle. Cut Black Felt Straps and add to the sides. Measure and cut Blue felt and glue to the second half of bottle. Add black fuzzy sticks for Minion Hair. 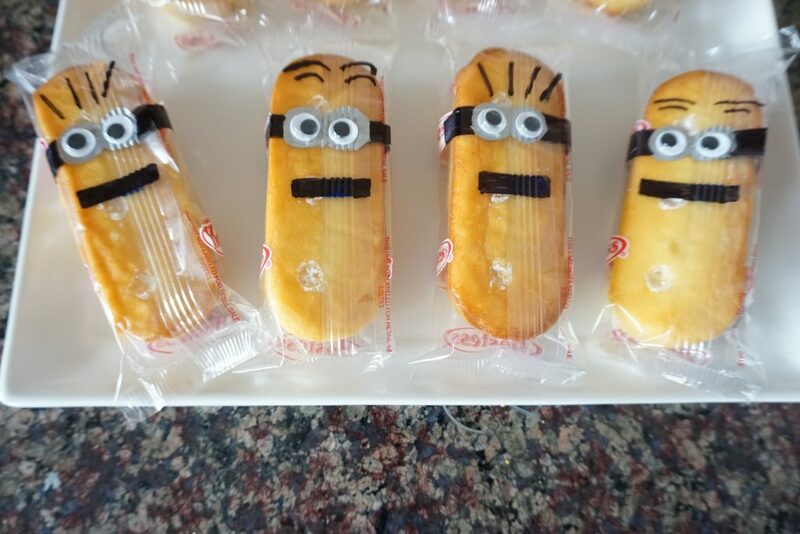 Banana Twinkies at your Minion party well definitely be a hit! Draw two small circle in the middle of Twinkies. Black Straps on the side with Black Sharpie. Draw small mouth and hair of the minion. Glue small goggly eyes with Hot Glue Gun. 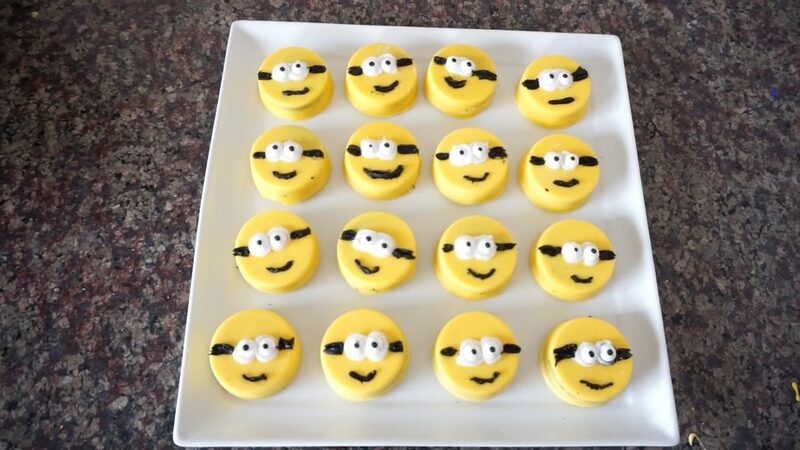 Not Perfect but cute Minion Chocolate Covered Oreo. First melt your chocolate in a Wilton Bag or microwave safe bowl. Dip your Oreos in the chocolate or use Oreo Molds. Put the Oreos in the refrigerator or freezer to harden. Add Frosting in the middle for eyes outline, add eyes on top. Draw straps and smile with Black Icing. Minion Trail Mix for me was such a great treat for my guest.. 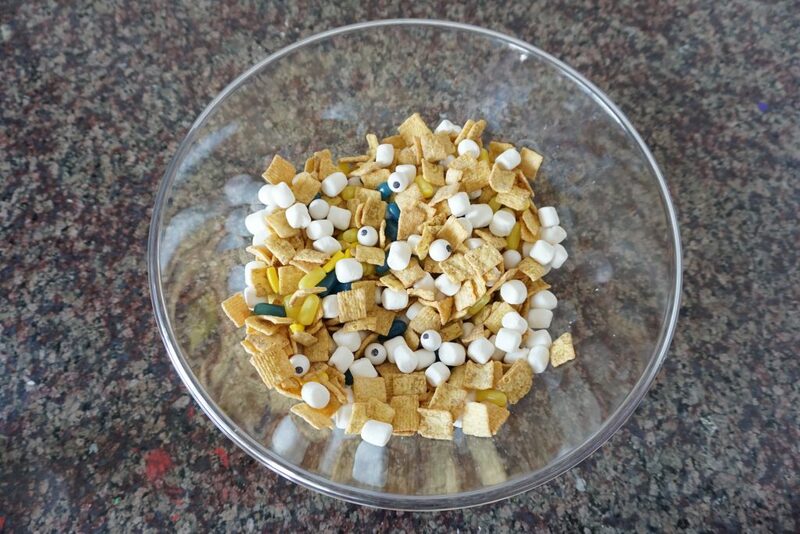 This was is very easy just add everything in one big bowl and mix. I decided to add them in a plastic container because our party was outdoors, but you can also leave and allow guest to help themselves. 2 Responses to "Minion Birthday Party Ideas!"